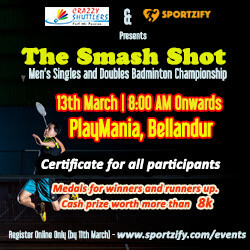 A loud call to all our champion badminton champs of Bangalore to participate in the upcoming badminton tournament at Playmania bellandur. REGISTER BELOW ONLINE ONLY - by 11th March. No on spot or ofline registration will be accepted. Participate and there is surely something to win for everyone.Sportzify will make sure you don't go empty handed. - Cash Prize worth more than Rs 8,000 to be won. - All participants are requested to be present atleast 10mins before their match timings. - The last date of registrations in on 11th March. Fixtures will be sent on 12th March 9:30PM. Kindly check your spam folders as well. We will also upload the link on www.sportzify.com/events. - The tournaament is only for non-seeded players. Any player found participating in the tournament and is a seeded palyer will be disqualified at that very moment. If player is playing doubles then the team is disqualified. - No on spot or ofline method of registrations will be accepted. - Semi Finals and Finals will be of 21 points best of 3 sets. - The Prize distribution will take place at the end of the tournament. Request all winners and runners up to be present. - All participation certificates will be given of as the teams or individuals lose their respective matches. Kindly share full name with correct spelling so that there is no mistake in the certificate. - Images and videos of the tournament will be shared on our facebook page - www.facebook.com/sportzify a day after the event. - Kindly enter the information about your doubles partner as well if your are participating in doubles tournament. - If any team or individual does not respect the decision of the referee or line umpires and does not wish to continue with their decision then in that case he will be disqualified from the tournament and the opponent gets a win. - Once the payment is done, it means that participants have fully understood the Terms & Conditions and agree to obey the Rules & Regulation of the tournament. There will be no refunds of entry fee in any case. -Images and videos of the tournament will be shared on our facebook page - www.facebook.com/sportzifyand www.facebook.com/crazzyshuttlers a day after the event. Book Your Tickets Below. Hurry Up !! Incase of any querry contact us at +91-7483053630 ; or mail us at hello@sportzify.com.